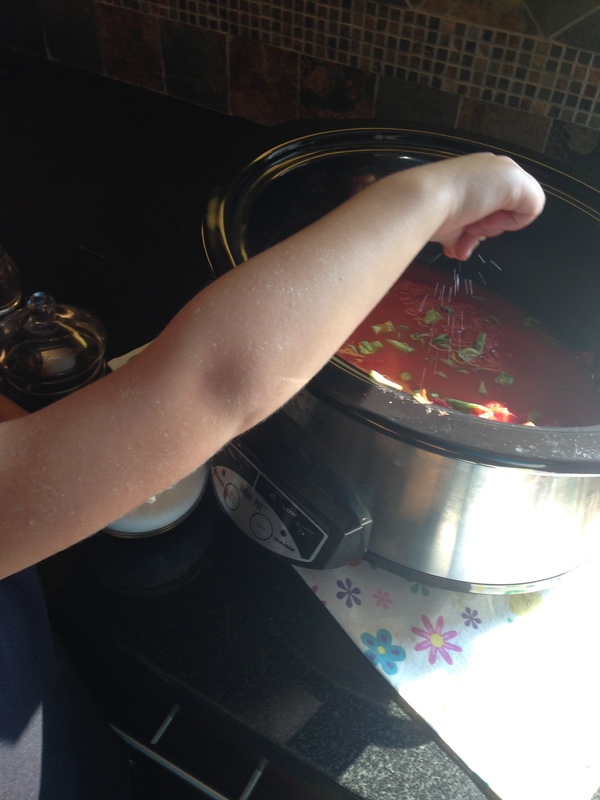 The Family Meal Project | Raising healthy eaters is a game of trial & error. We're here to try…. and err. 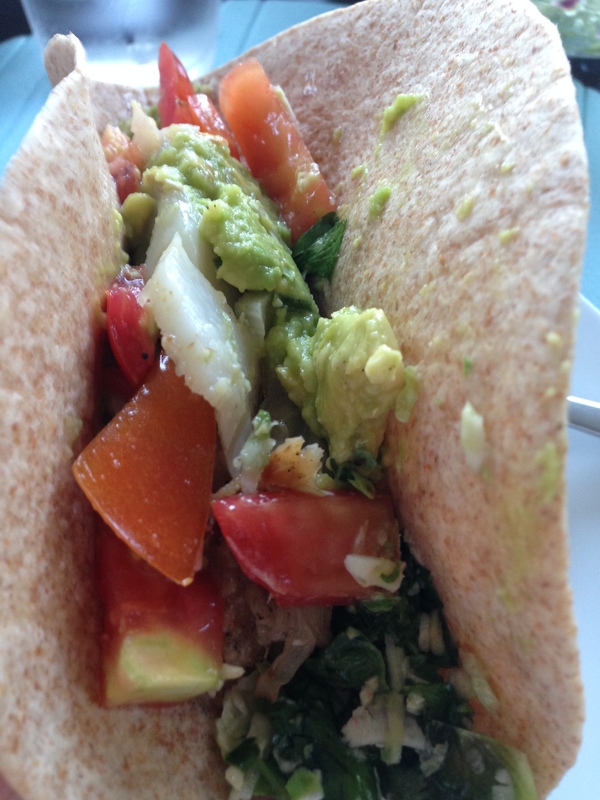 Raising healthy eaters is a game of trial & error. We're here to try.... and err. 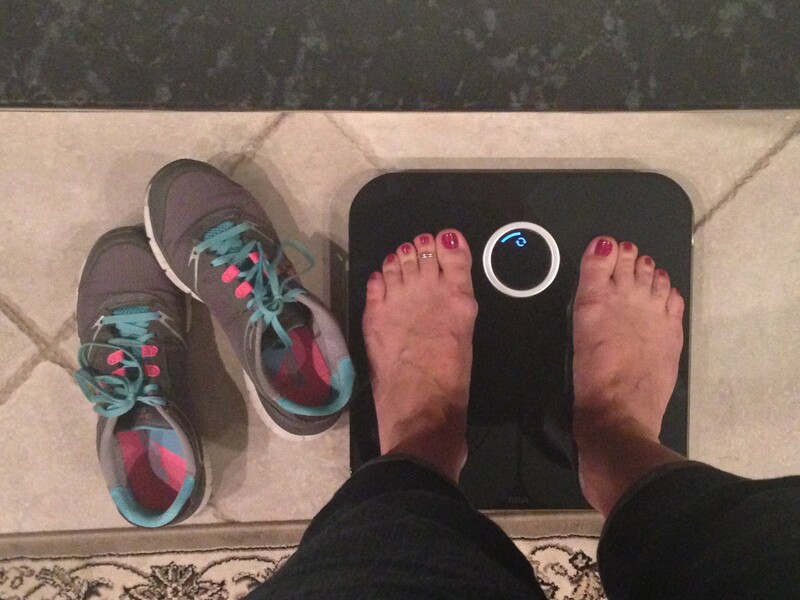 My husband and I are embroiled in a ‘Biggest Loser’ family weight-loss challenge. We’re pitted against some of his aunts, uncles and cousins to see who can lose the most weight in the weeks leading up to Thanksgiving. It’s a very low-key, friendly competition. We’re family, after all. But, it must be noted — who dropped a whole dress size the last time she went shopping?!?! THIS GIRL!! Woo-hoo!! 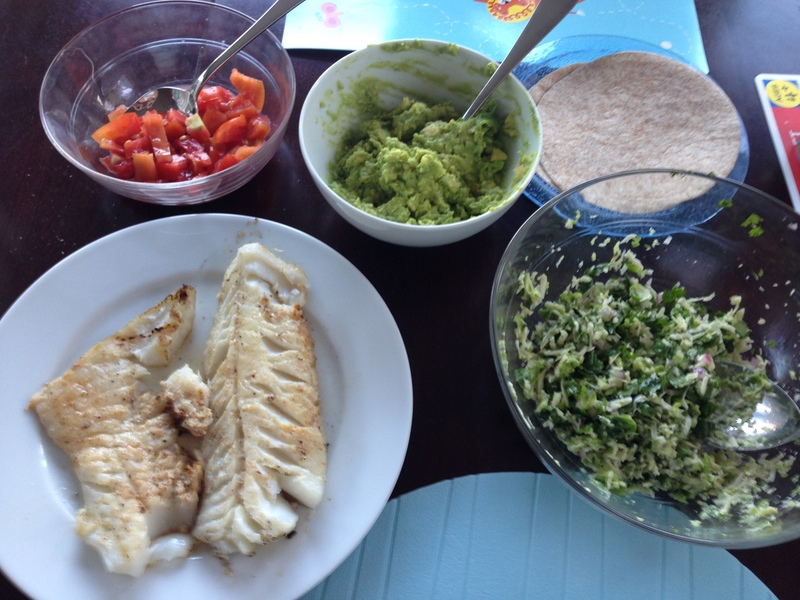 I’ve made fish tacos many different ways before. I’ve breaded the fish fillets and fried them. I’ve baked them. I’ve used a cream-based sauce. I’ve used a citrus-based sauce. You name it. But I never made them like this before. On the diet front: I like that this recipe stays healthier by replacing sour cream and cheese with the delicious, creamy avocado. And I avoided using too much salt by using fresh, chopped tomatoes instead of store-bought salsa. 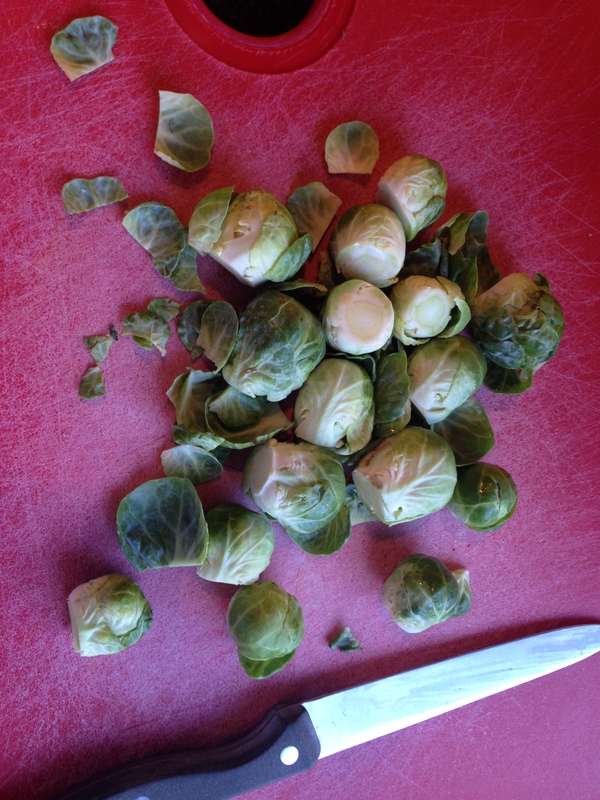 Now — to address the elephant in the room — BRUSSELS SPROUTS?!?! I didn’t have any cabbage, but did have the sprouts in my fridge so I gave them a try. 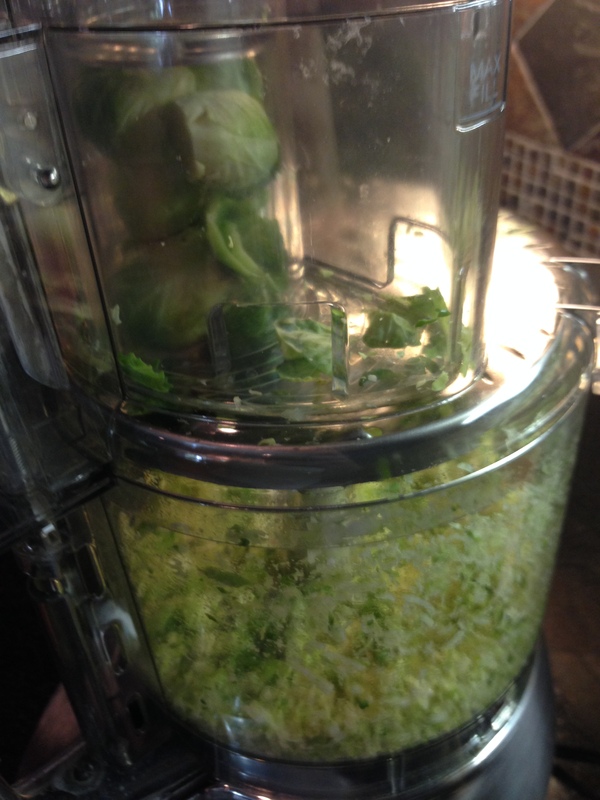 I’ve made plenty of slaws out of brussels sprouts with mixed reviews from the family. But this worked really well and added a nice tanginess when combined with the lime, garlic and cumin used to marinate the fish. 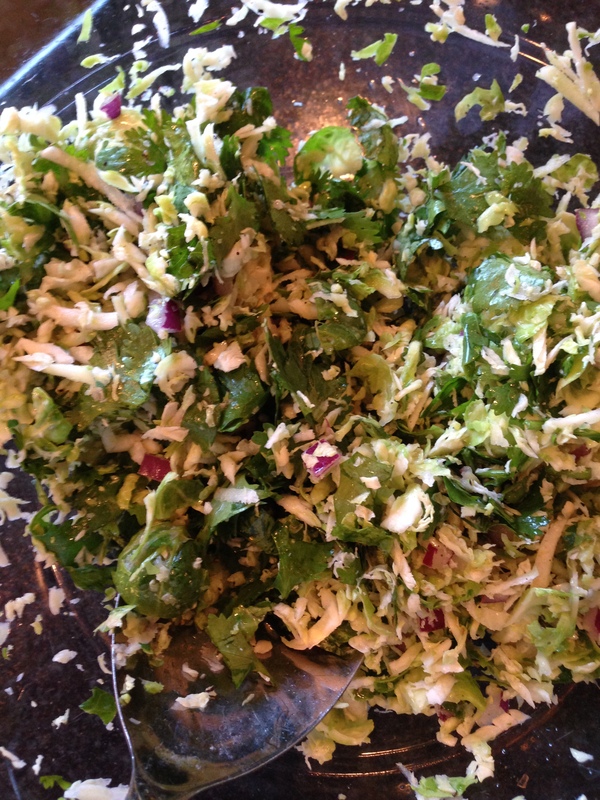 It might be a good way to sneak sprouts into your family’s meal plan. 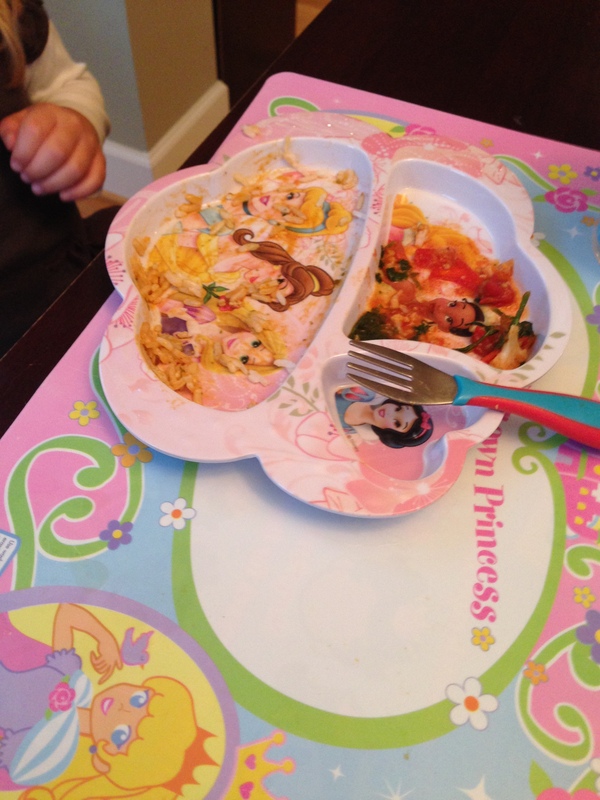 There were clean plates all around on this one, even with my 3-year-old. And I liked that it was a one-dish-meal with the proteins and veggies combined in one delicious concoction on a plate. Plus… to get such high-marks from my Beloved!! Well…. you know the best way to a man’s heart! 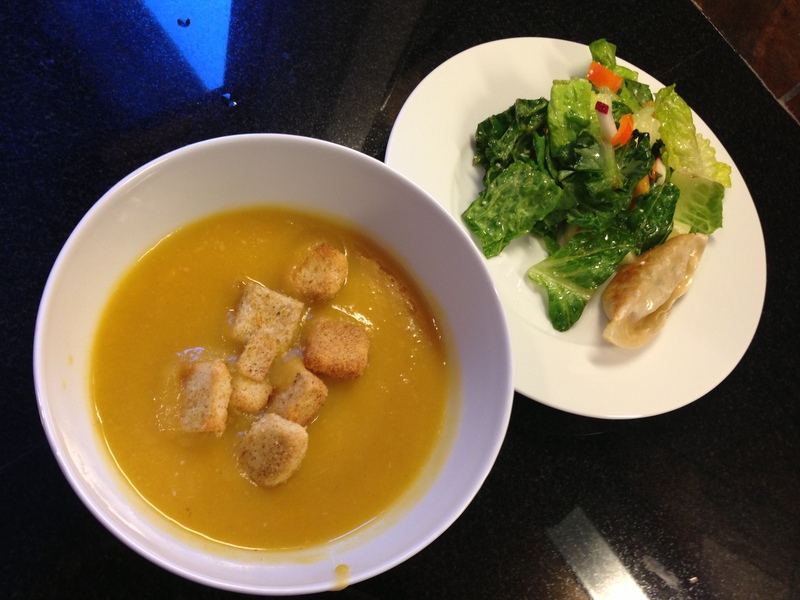 Needless to say, I’ll make this again… and again… and again! My friend just invested in her first slow cooker and was researching recipes when she came across this one. 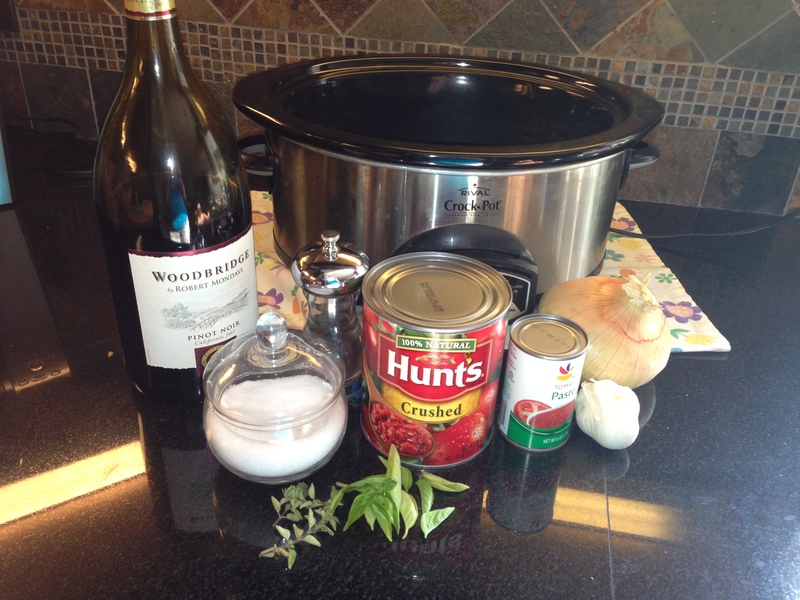 Knowing about my not-so-secret love affair with my own slow cooker, she passed it along to me. I never thought I would say this — but I’m getting sick of pulled pork. 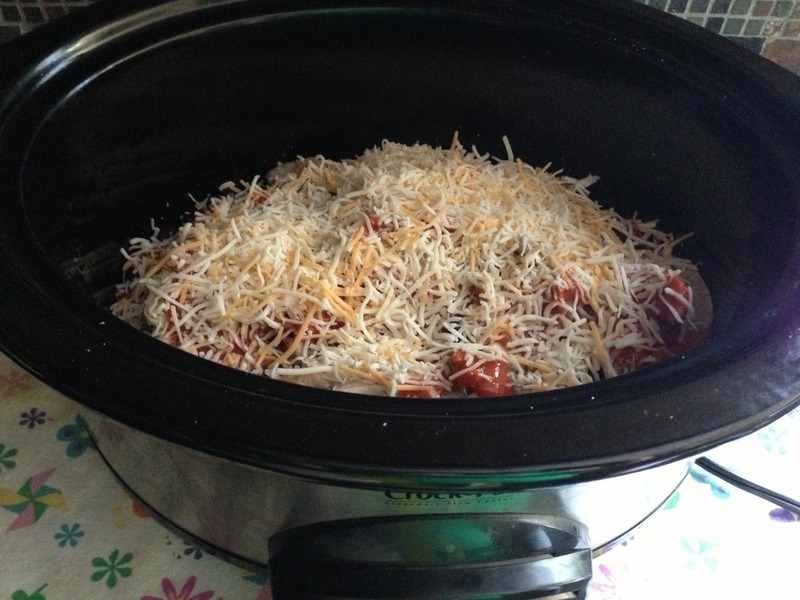 It’s probably my favorite thing to make in my crock pot because it’s so easy and delicious. But we have it ALL OF THE TIME and I’m starting to OD on it. So when my friend sent me this recipe, it spoke to me. 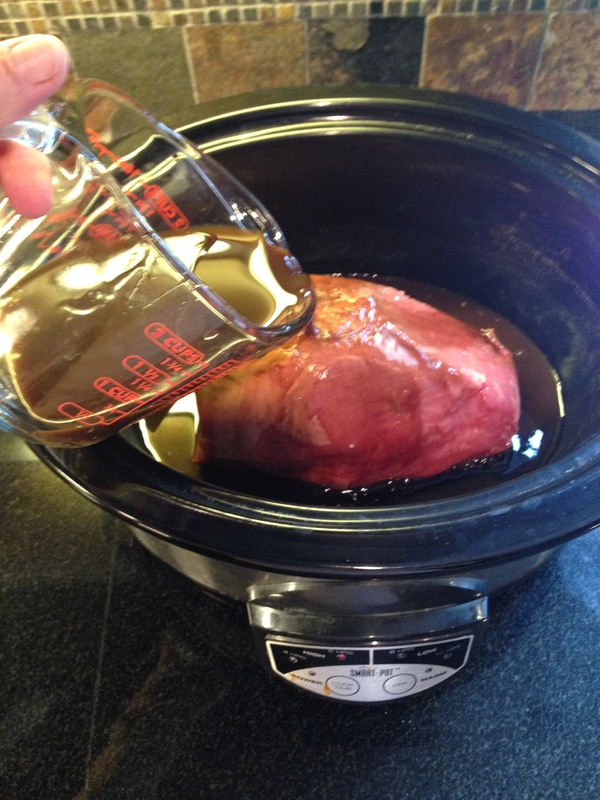 It’s uncomplicated AND involves a meat that falls apart when cooked low-and-slow. Yum. 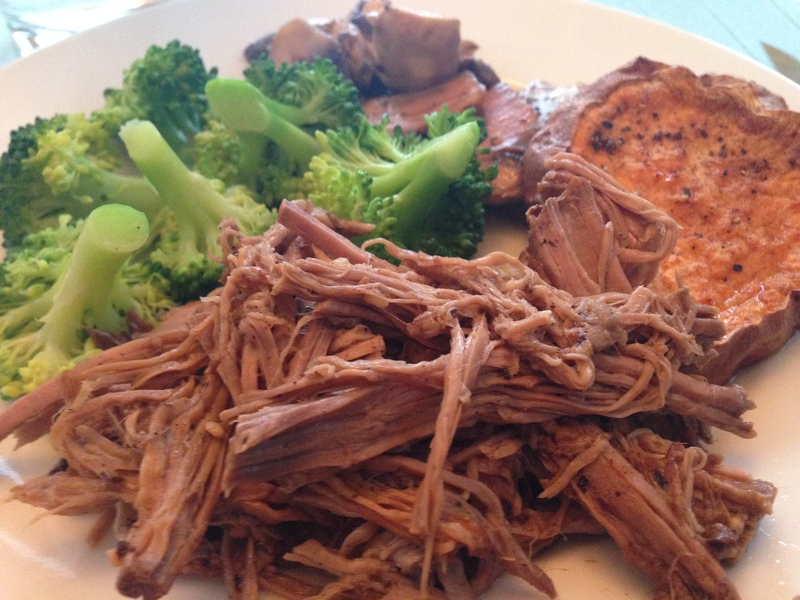 Her colleague gave her this recipe for Balsamic Roast Beef from www.addapinch.com. Take a look — you’ll see it’s incredibly easy. Honestly, it took me 5 minutes to throw the ingredients into the crock pot, set it to 6 hours on high, and then run out the door to run my errands. 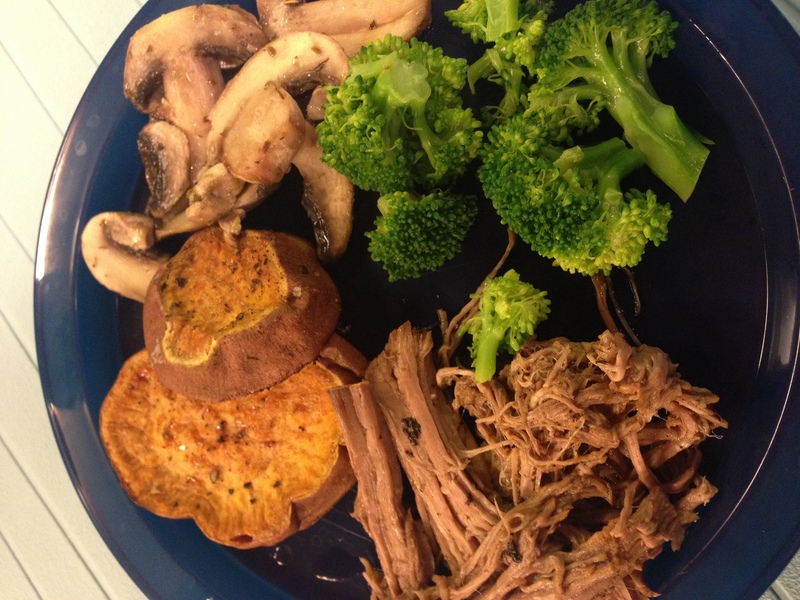 I served it with baked sweet potato rounds, sautéed mushrooms, and steamed broccoli. But would the family like it? my 7-and-5-year-olds really liked it, saying “it’s great!” and cleaned their plates! The Hubs thought it was great and had seconds! my friend, who I invited over to try, loved it. So thumbs up all around, right? Wrong. Personally… I didn’t hate it, but I didn’t love it. Not because it’s a bad recipe, but because I’m just not a fan of ‘sour’ meat. I’ve never been. I try, but it’s just not my thing. But, in this recipe’s defense, the sourness was very subtle. I also thought it turned out too dry. 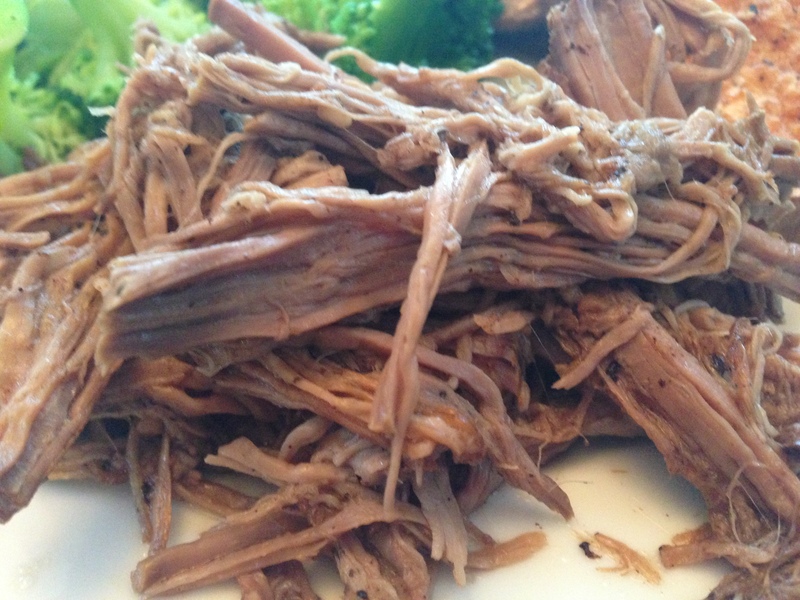 It didn’t pull apart as easily as, say, my pulled pork. I think it would be helpful if I used a smaller cut of meat in the recipe so there would be more liquid to make it more moist. That might help.. in my book. So I’ll make it again for my family who loved it — it just might be on a night when I have book club. Give it a try… you might think differently! Then, tell me I was wrong! I haven’t posted in a few days. But I felt compelled to send you each a thank you note as I come upon the 6-month anniversary of my first post here. When I left my career 7 years ago, I knew I was making the right decision for our family. But I LOVED my TV producing job and knew that taking writing out of my life was stripping me of something that was profoundly a part of me. As much as I tried to sneak in a journal here-or-there (and tried writing the next Great American Novel), nothing was sustainable… until now. The key: accountability. I needed to know someone was interested; someone was reading. When I worked in TV news, I would scrutinize the ratings each-and-every-day wanting to know: Was anyone really watching? And, more importantly…. why? Many moons ago, early in my career, I wrote a story about how the way couples sleep together can decode their relationships. That night, after the story aired, I was at a party and overheard some women talking about it. They, literally, relayed the story to their friends WORD-for-WORD (without knowing who I was). It made me realize the power of the broadcast word and how people believe what they see and hear on TV. This knowledge helped guide me for the next 12 years of my career, until that career ended with the birth of our oldest son. Now that I’ve traded in broadcasting for ‘posting’, it’s amazing to me that you are actually reading this little experiment of mine. You come from the U.S. From Canada. From the U.K. From Singapore!! You might be my sister-in-law. My aunt. My cousin. My neighbor. My former roommate. My former colleague. My friend from high school. My sorority sister. My friend from our kids’ preschool. From our elementary school. You might be my mother. My mother-in-law. I don’t know who you are! But I want you to know that I am humbled beyond measure. When read that all of you have read my blog over these past few weeks, it brings me to tears because I never thought I’d find such joy AND value in my writing again. But I want this to be so much more interactive than it is. I REALLY want to hear from you!!! I want to know what you’ve tried. What you loved. What you hated. I think as a community, we could help each other teach our kids to eat well. And remember… I’m always grateful to you. You are the reason I found my voice again…. 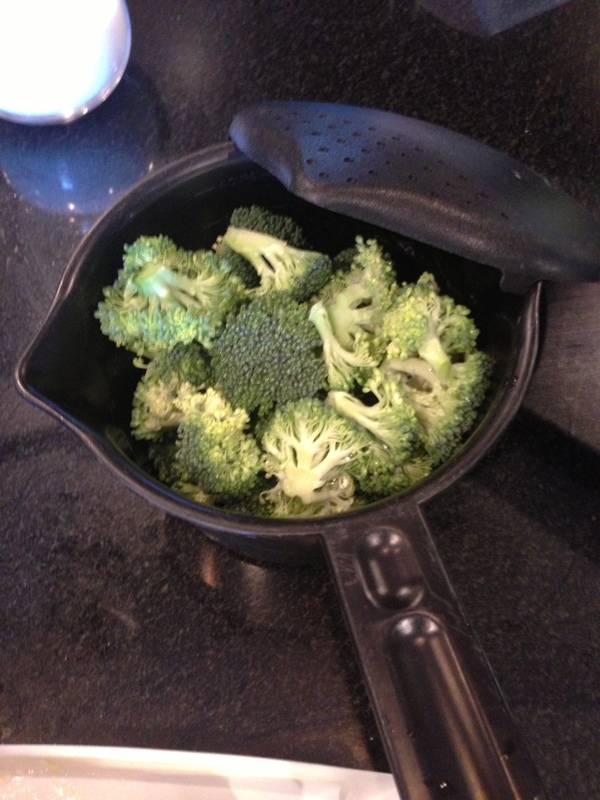 In my efforts to shed a few LBs and get some healthy recipe ideas, I “liked” a site on Facebook called Paleo Pot. The website is great and has very simple, idiot-proof recipes. Just what I need! 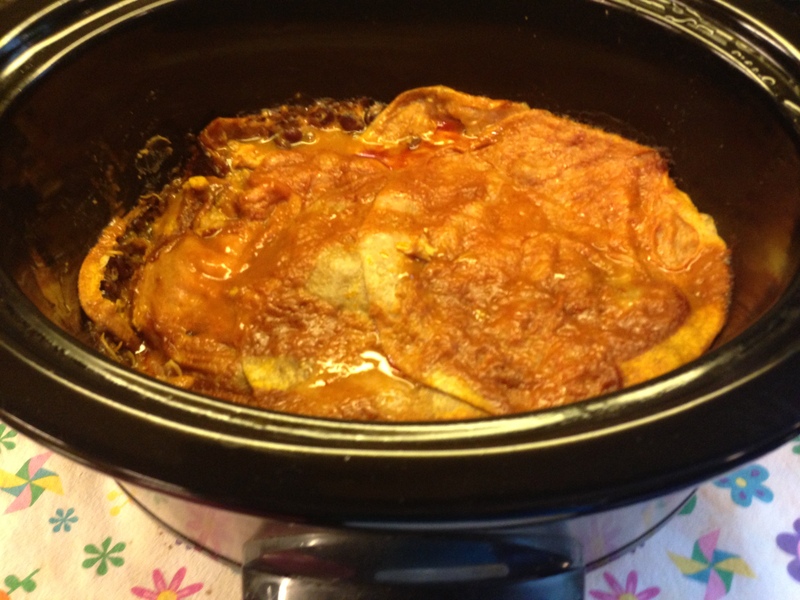 A couple of weeks ago, they posted this recipe for Super-Easy Crock-Pot Spaghetti Squash Curry. Considering some of my favorite words are “crock pot,” “curry” and “spaghetti,” this was high on my ‘Recipes to Try’ Pinterest board. They weren’t kidding when they called this ‘super-easy!’ Just follow their quick-prep directions, toss everything in the crock pot and go! But be careful you don’t buy a squash that’s too big. Mine almost didn’t fit into the crock pot once it was split in half. And it made much more than my family could eat. This dish was very flavorful. My 7 year old typically snubs his nose at curry dishes, but he cleaned his plate and asked for seconds. My 3yo gobbled it up. My husband also really liked it. Very surprising considering I accidentally bought the ‘hot’ red curry paste in my rush through the grocery store! Yikes! The person who surprised me the most was my 5yo. This kid is ALL about spicy! He eats a mound of wasabi straight when we go out for sushi! He puts spicy horseradish sauce on his steak! He started eating Lamb Vindaloo at 18 months old! But this squash — he wanted nothing to do with it, saying he doesn’t like curry! I was SHOCKED! 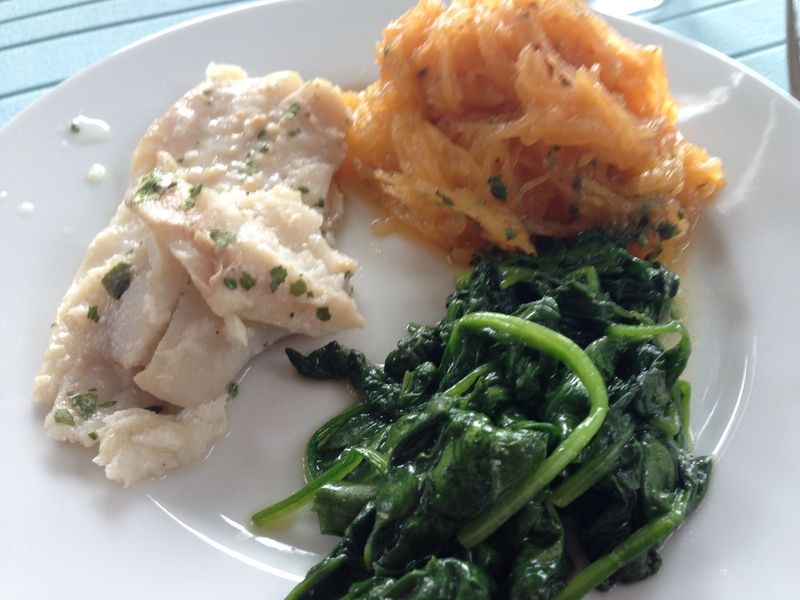 I served this with baked flounder and sautéed spinach. Probably not the best pairing, on my part. But I’ll make it again because it’s different than most of the recipes in my usual repertoire and oh-so-simple. Give it a try. 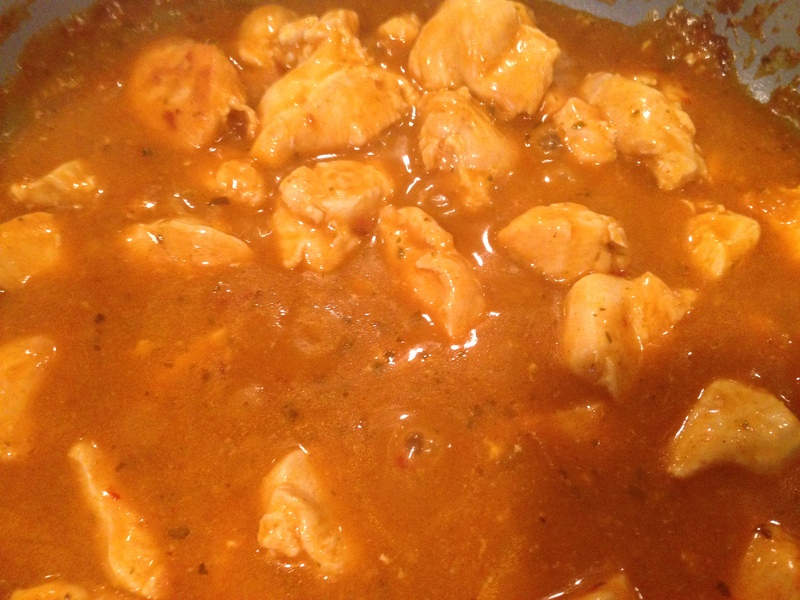 If you like coconut curry, you might like this! So… true disclosure: I’m on a diet. It seems like I’ve been on a diet since my oldest was born 7 years ago and the great figure I used to complain about disappeared more with each beautiful life I created. But this time, I’m REALLY on a diet. I turn 40 in T-minus 2 months and, I swear: I. Am. Going. To. Own. 40. I’m exercising. I’m watching what I eat. I got myself a Fit Bit. I’m in it to win it. But I have a little problem. 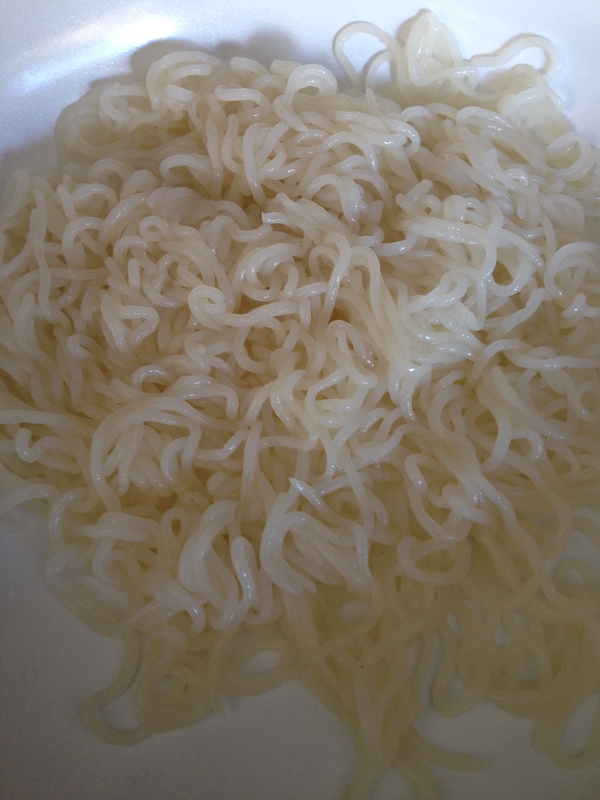 Spaghetti. It’s just so darn delicious. So, I decided to trick my mind and body and try something new. Honestly, the mere thought of this struck me as absolutely gross. It sounds pretty icky, doesn’t it? I didn’t even dare test this on the kids because I wanted to check it out first. But the Hubs didn’t escape. He was, as always, my ultimate guinea pig. Here’s the thing: I was VERY skeptical. 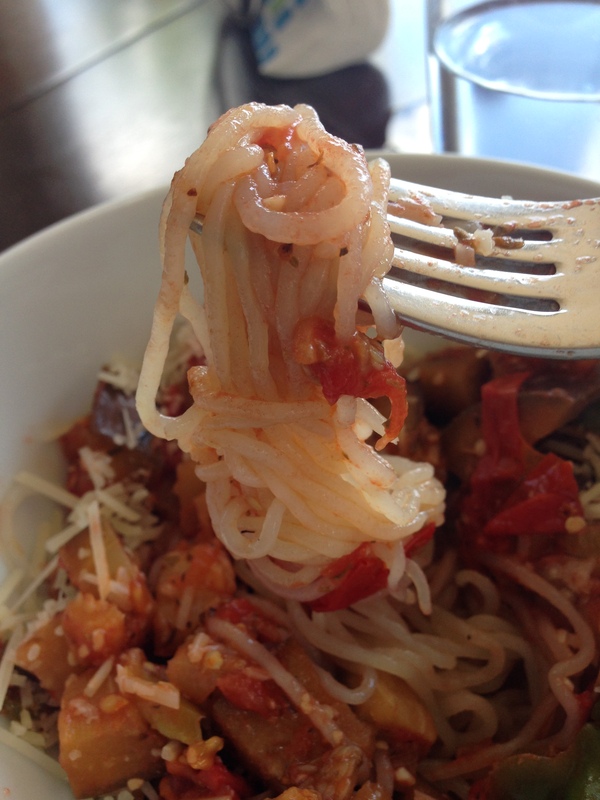 It certainly LOOKS like spaghetti, and when you take it out of the bag it feels like cold, cooked spaghetti. Plus, it only has 20 calories a serving and takes about 3 minutes to cook. (just follow the directions on the package.) But… c’mon. This can’t taste good. Can it? I’m not gonna lie. It ain’t spaghetti. Its texture is different, somewhat chewier. 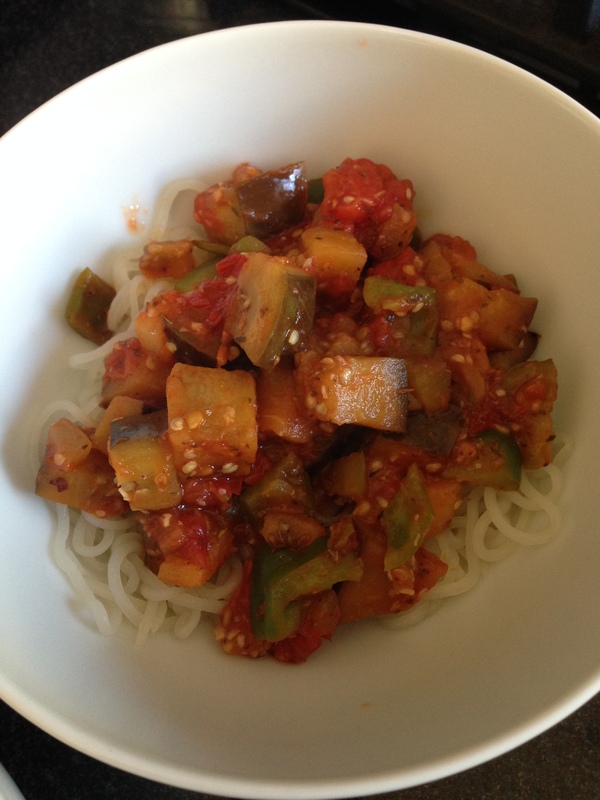 But once you get past the texture I didn’t find it all that different from spaghetti, especially after I topped it with the eggplant and tomatoes. I think it would also be good topped with tomato sauce, as part of a Veggie Primavera, or as cold sesame noodles. I’d eat it again, particularly as I try to loose the dreaded belly before our big anniversary vacation that’s coming up. 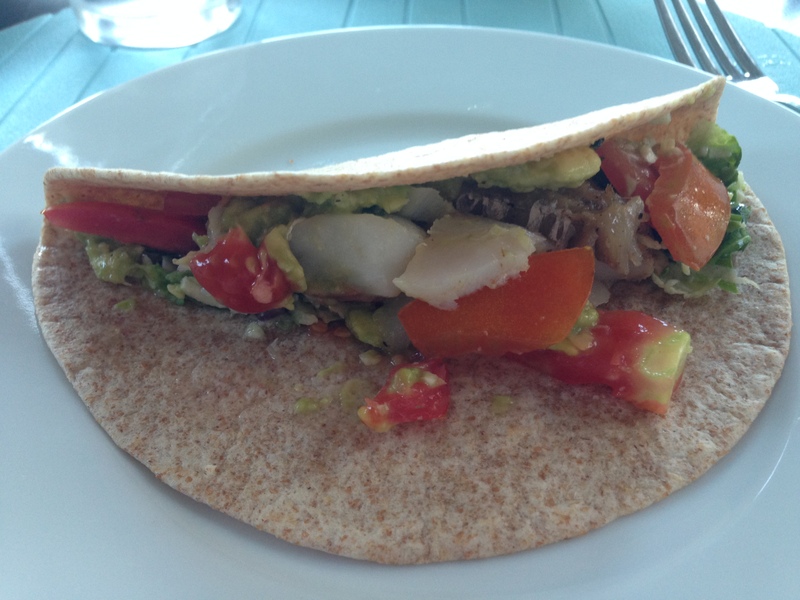 It makes a quick, low-cal, low-carb meal. The Hubs is not sold. He ate it. He tolerated it. He would eat it again if I made it and that was all there was for dinner. But as he told me tonight, he definitely would not ask for me to make it again. It’s FALL!!! Fall! Fall! Fall! Fall! 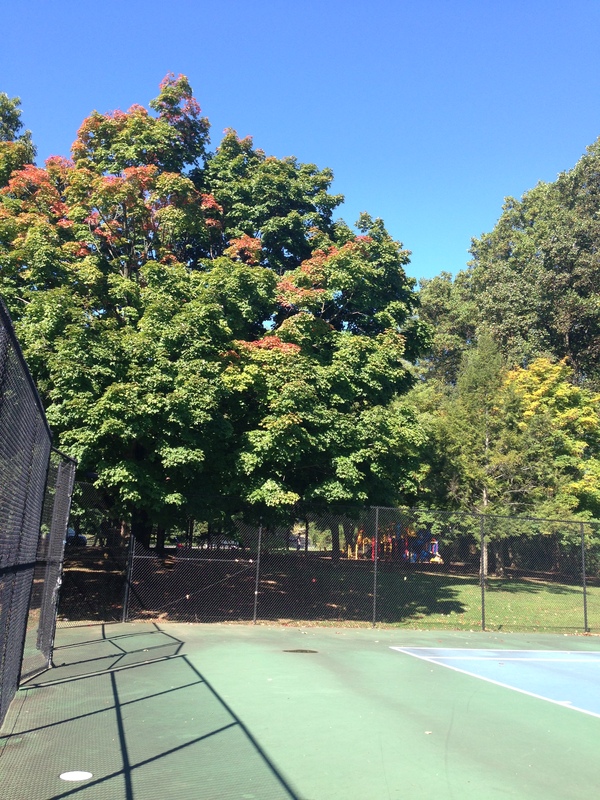 I spied my first sight of fall leaves at our park the other day and nearly jumped with joy!! Oh! I love it so much!! I have to say it again! The air is crisper, cleaner. Out come the comfy sweaters; in go the dreaded bathing suits. The kids are back at school. Hooray! And we can’t forget the wonderful foods that return with Fall — apples, pears , brussels sprouts, root veggies, squashes. All so comforting and delicious on chilly autumnal nights. 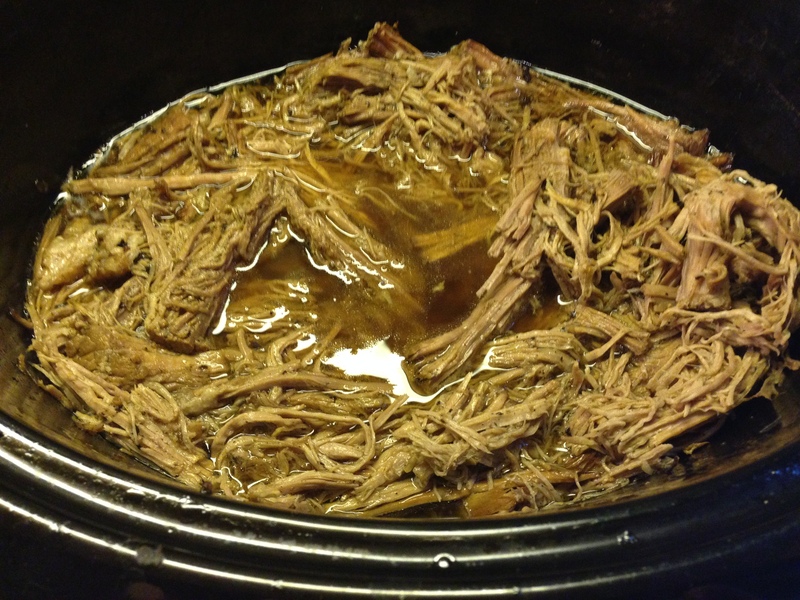 Most nights in the Fall and Winter, I use my slow-cooker. I throw everything in and let Old Trusty do the work for me. It’s a savior when the after-school activity schedule gets the best of us. 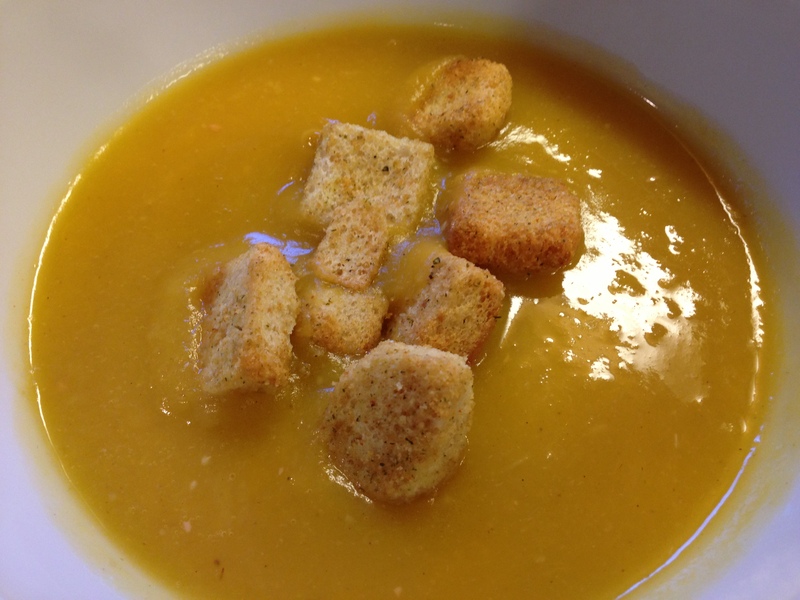 So I do a lot of soups and stews — and I made one of our family’s favorite Crock Pot meals this week: Butternut Squash Soup. 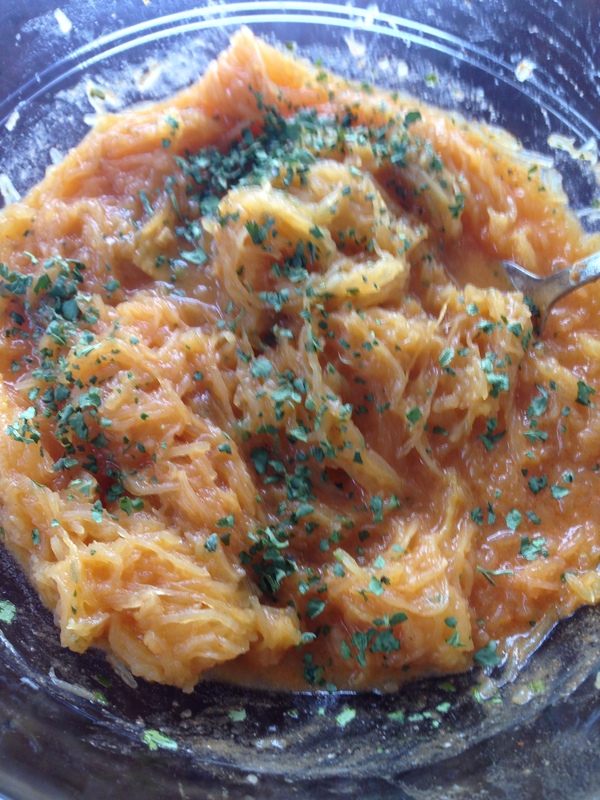 Pierce the squash with a fork several times all over and microwave it for 2 minutes. Check it to see if the shell is starting to get soft. If so… you’re good. If not, nuke it another minute at a time until the shell gets soft enough to peel with a veggie peeler. While the squash is in the microwave, saute onion and garlic in olive oil on your stove top. Peel the squash, scoop out the seeds, and cut the squash into 1-inch cubes. 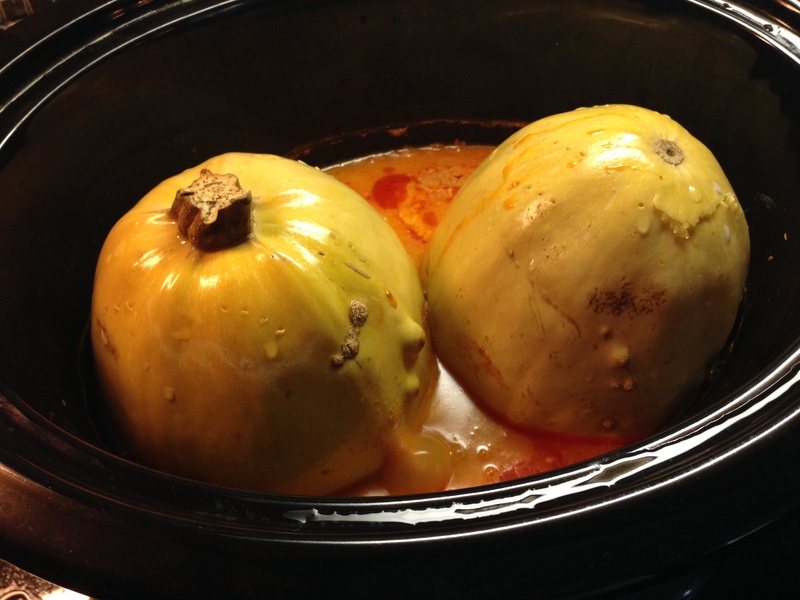 Put the squash, apple, onion, garlic, beans, chicken stock, cumin and nutmeg into the slow cooker. Use an immersion blender to mix it all up. There are never complaints at our table when I make this. Everyone loves it. And I particularly like that the cannelloni beans become a hidden ingredient in this dish. 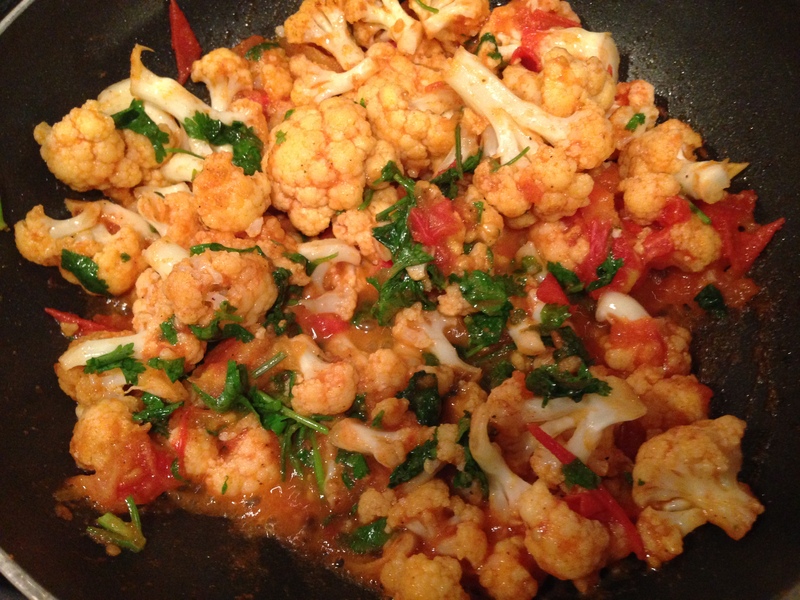 They add protein to a veggie dish and make it creamy without the added calories of cream. It’s my favorite trick to use in soup recipes that call for cream. It’s a standard meal in our house especially on busy, chilly, fall nights. You know those nights — the ones where one kid has soccer, one has baseball, you have Back To School Night, the Hubs is working late. Those are the nights when everyone is running in different directions, but you still want to bring everyone together to the table. One night’s dinner was an adaptation of this recipe from allrecipes.com. (If you haven’t visited this site for dinner inspiration, you should.) 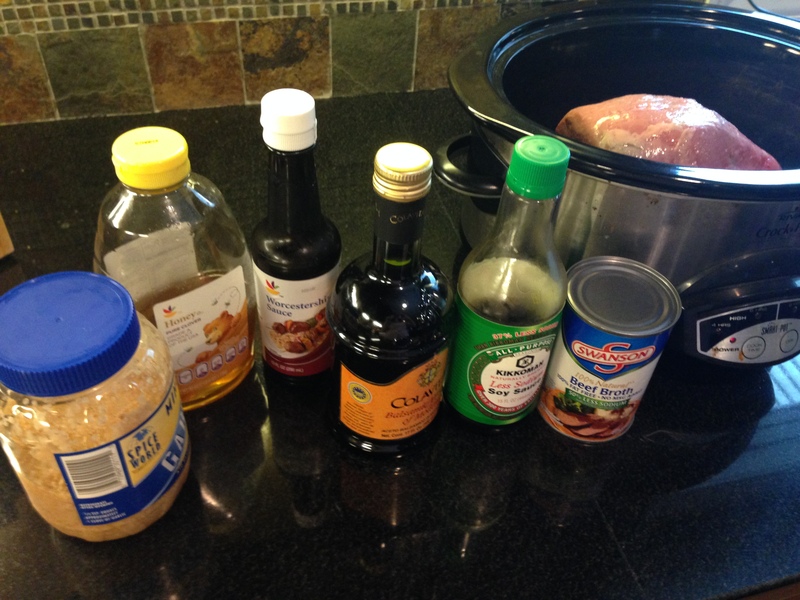 I find most of the recipes 1) call for things I already have on hand; and, 2) are easy and quick to make. Cover the tortilla with 1 cup of the chicken, the can of corn, a sprinkling of garlic salt and chili powder (to taste) and half of the cheese. 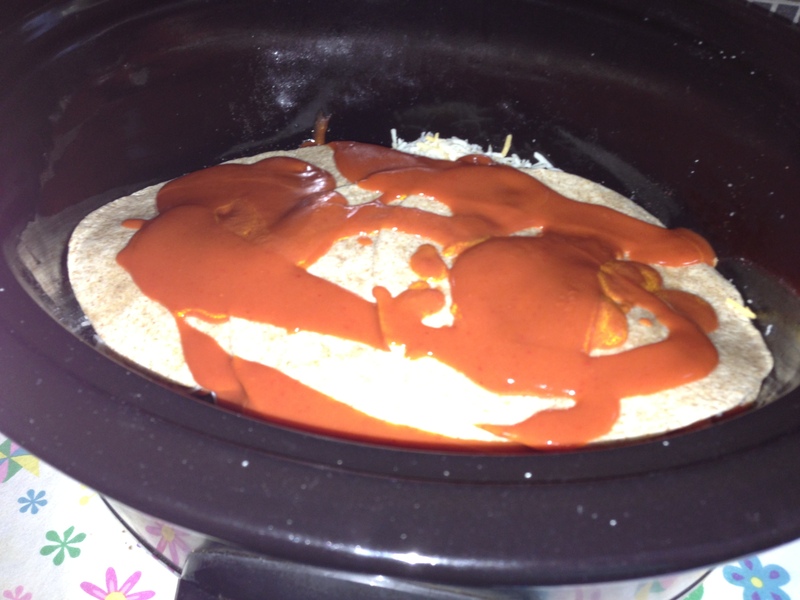 Pour about 1/2 of one can of enchilada sauce over it. Top the mixture with 3 more tortilla, the remaining cup of chicken, the can of black beans, another sprinkle garlic salt and chili powder (to taste), the remaining 1/2 of the cheese, 1 can of enchilada sauce. Top this with the remaining 3 tortillas and the remaining enchilada sauce. I’m going to tell you what. The pictures don’t make it look like much but it was SO easy and very tasty! And my family liked it — the Hubs even asked me to put it into the regular rotation! My 7-year-old “isn’t really a fan of black beans” (his words) but he ate everything else on his plate. In my opinion: Winner! Winner! Chicken Enchilada Dinner! Now that school’s in session again, that means one thing: families on the run. We learned that first hand tonight as baseball season started up again. 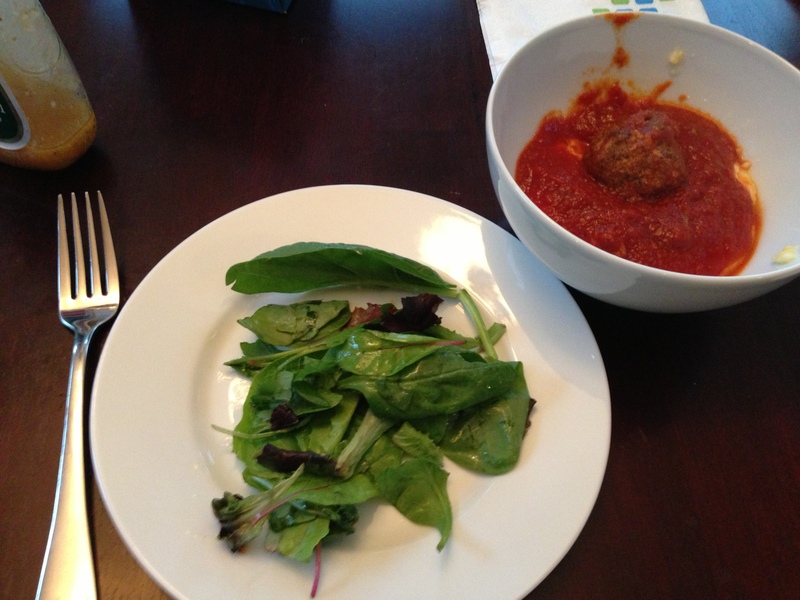 My son’s baseball team practices until 5:30 — prime dinner time in our house. So tonight, by the time practice ended and I was set and ready to start dinner, it was 6pm. I needed something quick and easy so I could feed the beasts and get them to bed! My husband asked for fish tonight and, frankly, I’m just tired of salmon. We eat salmon here all of the time. When I saw sea scallops were on sale today, I thought they were the ticket. I used this recipe as a basis for our dinner tonight, but with some tweaks (not to be confused with twerks.) 🙂 And if you have 30 minutes or less… this can be your dinner, too. Heat a large skillet. Melt 2 Tbsp butter with 2 Tbsp olive oil. Sear the scallops for about 3 minutes on each side until they’re cooked through and browned on each side. 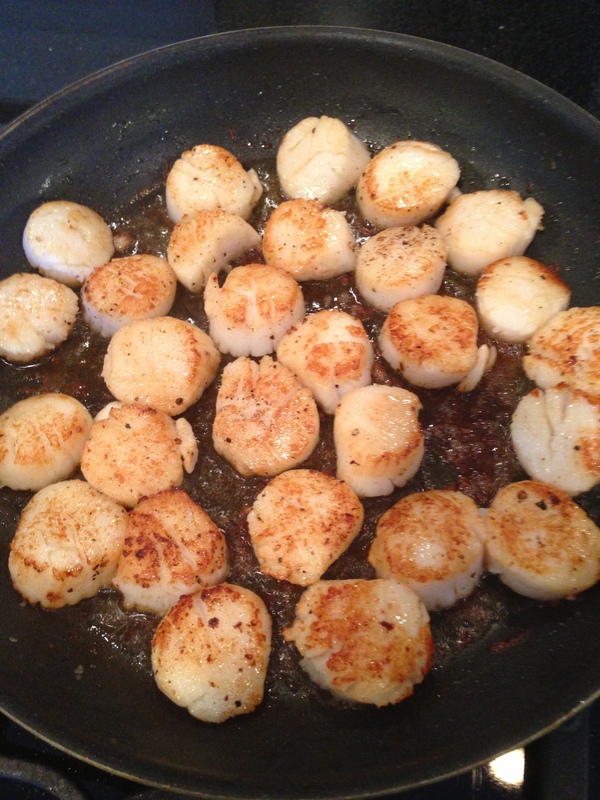 Once the scallops have been seared, transfer them and keep them warm on a separate dish. In the pan, saute butter and garlic. Add the white wine and lemon juice and let it cook down. 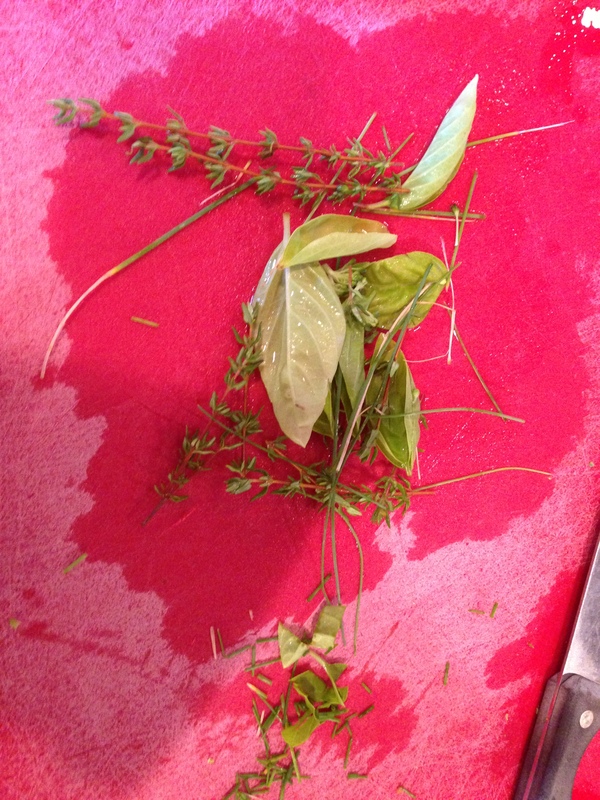 Add the chopped herbs and let simmer for 2-3 minutes. 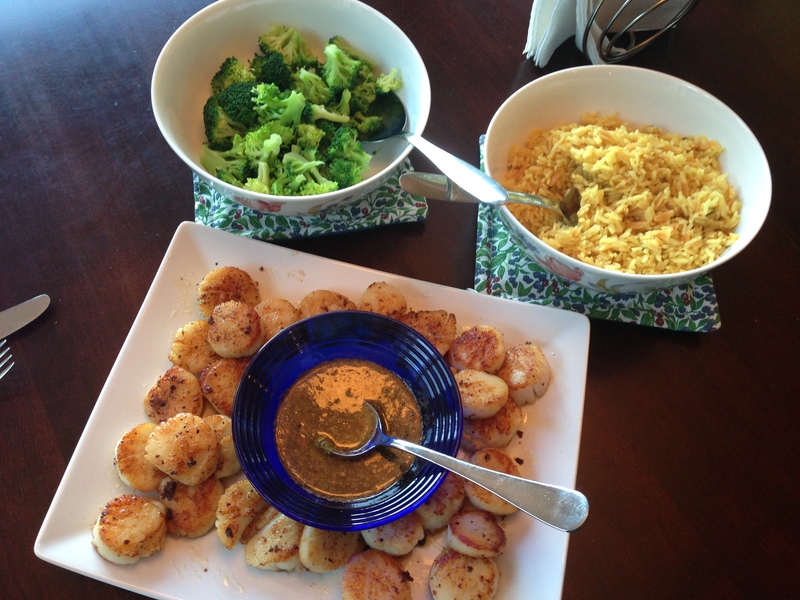 Serve over the scallops. My husband and I thought this was delicious. 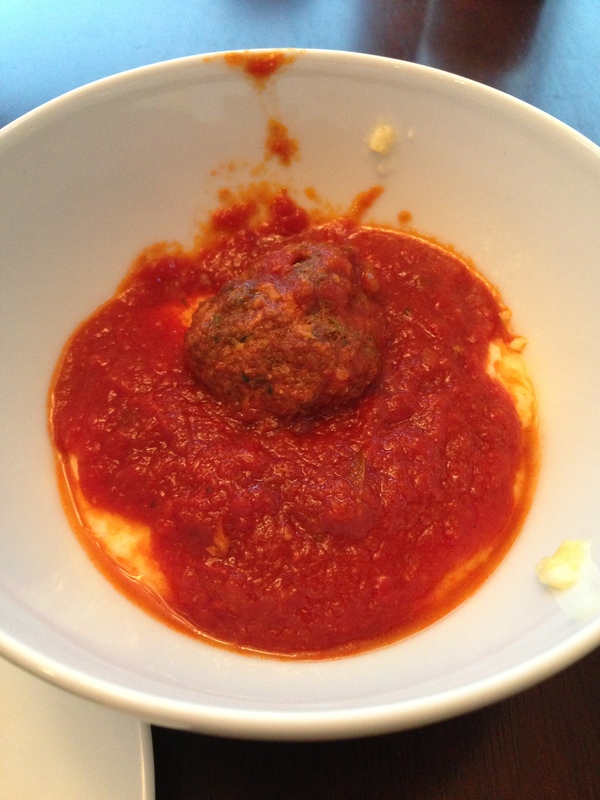 And the kids loved it — our boys really liked it, but actually could have done without the butter sauce. I get it. If I wanted to make this healthier, I’d make it without the butter, too. But I’ll definitely make scallops for our family again. Quick. Easy. Dinner is done.